Do Cement Drips Cause CPVC Fire Sprinkler Pipes to Fail? Every CPVC fire sprinkler piping system has at least a few vertical drops with cement drips running down the pipe from the joint above. When a crack forms next to a drip, experts often claim that the failure was caused by defective installation. However, when a crack forms next to a drip, the failure mode is generally ESC caused by exposure to an incompatible chemical. Cement drips are not incompatible chemicals. So why did the crack form? The crack formed because the cement drip absorbed incompatible chemicals present in the water. We have found that the incompatible chemicals most frequently absorbed by cement drips which lead to failure are antimicrobial chemicals. Antimicrobial chemicals are often added to the water in fire sprinkler piping systems as an additive (e.g., Potter Pipe Shield) or as a lining inside steel pipe (e.g., Allied ABF pipe). Some glycerine based antifreezes also contain antimicrobial chemicals (e.g., FFS Protect OL). Cement drips in and of themselves are not a problem. However, when combined with the use of antimicrobial additives, failure can occur. Should I Use PVC or CPVC For HVAC or Hydronic Heating/Cooling Systems? Architects often specify CPVC and/or PVC piping for Hydronic Heating or Cooling Systems. With these systems water or a glycol solution is recirculated through a heat exchanger. Unfortunately, heat exchangers sometime leak. When they leak, compressor oil will contaminate the fluid inside the recirculated piping system. Since compressor oil is highly incompatible with both PVC and CPVC, failure of the piping system occurs. We have found the failure occurs first in the fittings. This is because the cement inside the fittings is porous and rapidly absorbs the oil concentrating the oil inside the fittings. Because both PVC and CPVC piping will fail if exposed to compressor oil, we do not recommend the use of PVC or CPVC piping for use in HVAC or hydronic heating/cooling systems. How Can I Determine if I have Allied ABF Pipe in My Sprinkler System? Most condominiums use steel pipe in the risers running up the stair wells and frequently down the corridors. Transition to CPVC most frequently occurs in the corridor and the piping is all CPVC inside the apartments. Generally the steel pipe running up the stair wells is painted so you cannot identify the pipe. However, by accessing the ceiling above corridors you should be able to read the print line on the steel pipe. If the words "Allied ABF" appears in the print line on the pipe, you may be at risk. If your building was constructed before 2005 and the print line on the pipe indicates that it is Allied ABF, the ABF pipe will be likely be compatible with CPVC. If however, your building was built between 2006 and 2010, the Allied ABF pipe will be lined with the new formulation which is not compatible with CPVC. If you are concerned whether your building is at risk, contact us. We will send an Engineer to non-destructively examine your piping system to determine if the CPVC has been attacked by the Allied ABF chemicals. 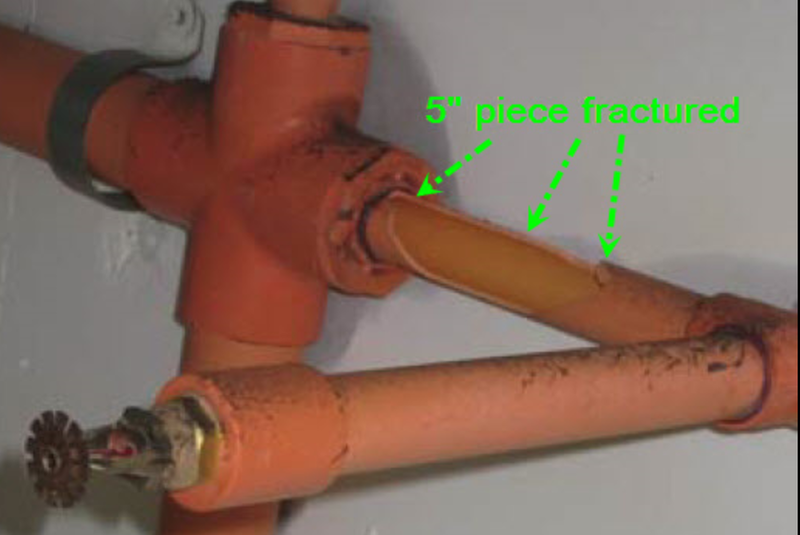 Why are there are so many failures of orange CPVC fire sprinkler pipes and fittings? The main reason is that CPVC is not compatible with most hydrocarbon chemicals and chemicals are everywhere. One of the chemical contaminants we frequently find on the inside of CPVC pipe are chemicals from the antimicrobial liming used inside of Allied ABF steel pipe. The chemicals absorb into high stress points and in cement residues inside joints. If you are concerned that you may be at risk because your fire sprinkler piping system contains both Allied ABF steel pipe in combination with CPVC, contact us and we will examine your piping system using endoscopy to determine if there is any evidence of chemical degradation of the pipe and fittings. The assessment is fast and is non-destructive. Will Allied ABF Cause My CPVC FIre Sprinkler Pipes to Fail? Why Do CPVC Pipes Turn Brittle? When CPVC pipes are first manufactured they are highly ductile. You can hit them with a hammer or bend them and they will not break. However, after a short time in service they can become brittle and break like glass - why??? CPVC is tough because it consist of long CPVC molecules which are entangled with each other like spaghetti noodles. However, the pipes lose their strength if the molecules become disentangled from each other. The water pressure inside the pipes are trying to pull the molecules apart but the molecules are locked in place because the pipes are rigid. Exposure of the pipes to certain chemicals cause the CPVC to soften. When this happens, the molecules are no longer locked in place and they start to disentangle from each other causing the pipes to become brittle. Since most hydrocarbon chemicals will absorb into and soften CPVC and there are hydrocarbon chemicals everywhere, it is no wonder why there are so many brittle failures of CPVC piping! For example, I have CPVC drain pipes in my home. One day my wife accidentally spilled a bottle of detergent into the sink. She thought nothing of it and did not flush the detergent through the drain system but allowed it to set in the sink-drain for several hours. The next time she when to use the sink, water flowed from the drain. When I investigated, I discovered that the entire drain system had turned brittle and had to be replaced. Plumbers are becoming aware of this problem and are starting to turn away from using CPVC piping products - see http://www.plumbermag.com/how-to-articles/corporation_lubrizol_pipe_materials/potential_plumbing_problems_lurking_in_walls . If you have CPVC piping in your building and are concerned. let us know and we will be pleased to investigate to determine if your pipes are becoming brittle. Which Type of PEX is Best? PEX pipe is polyethylene pipe that is cross-linked (X-linked). Polyethylene (PE) consists of long molecules or polymer chains. When PE is heated it softens and can easily be deformed. Therefore PE pipe cannot be used for hot water service because exposure to hot water for long periods of time would cause the pipe to soften and deform (creep) under sustained water pressure inside the pipe. The deformation occurs because the polymer chains are pulled apart. This problem is solved by chemically tying the long polymer chains together so they cannot be pulled apart. This process is called cross-linking abbreviated using the letter X. Since the long polymer chains are chemically connected, they cannot separate so PEX does not deform or creep when used long term in hot water service. PEXa adds chemicals (peroxides = oxidants) to the PE which create highly reactive free radicals which attack the PE chains causing them to bond together. Unfortunately, free radicals are oxidizers and they actually make the PE less stable and more prone to oxidative degradation because the PE is partially oxidized (degraded) during its manufacture. PEXb uses a process which is not based on free radicals and therefore the PE becomes cross-linked without exposure to oxidation processes. PEXc process involves two steps. The first step involves manufacture of PE pipe coils. The PE pipe coils are then sent to another company which uncoils the PE pipe and exposes the pipe to high energy radiation. The radiation attacks the PE pipe making the PE polymer chains reactive with each other. Unfortunately the energized PE polymer chains are also reactive with oxygen in the air and also the antioxidant stabilizers in the pipe which stabilize the pipe against degradation during use. The PEXc X-linking process bombards the pipe with an uneven dose of high energy radiation so that the pipe is not uniform in composition around its circumference. The antioxidants in the plastic formulation are destroyed by the high energy radiation, and because the radiation dose is not uniform around the pipe, the final PEX pipe is not uniform in its resistance to oxidation during use, especially when the pipe is used in hot water service. To summarize, PEXa and PEXc processes both involve oxidation chemistry which partially oxidizes (degrades) the pipe during the manufacturing process while PEXb process does not involve oxidation chemistry. PEXb is best because the antioxidants are not destroyed during the X-linking process and the pipe is not exposed to oxidative processes. Therefore, PEXb is inherently more oxidation resistant than PEX a or PEXc. Since, it has been our experience that the main cause of failure of PEX is oxidation, PEXb is best because it is inherently more oxidation resistant. What Grade of PEX Pipe Should I Use? There are many different grades of PEX pipe. All PEX pipe is manufactured with a print-line listing information about the pipe. Information included in the print-line include the name of the manufacturer, what standards the pipe complies with, and the grade of the pipe. The grade of the pipe is indicated by a series of four digits. The first digit is generally considered to be the most important because the number indicates the resistance of the pipe to degradation by exposure to hot chlorinated water. If the first digit is 1, the pipe has passed a test showing that it will remain ductile and not fail when exposed to hot chlorinated water 25% of the time. If the first number is a 3, the pipe has passed a testing showing that it will remain ductile and not fail when exposed to hot chlorinated water for 50% of the time. If the first number is 5, the pipe has passed a testing showing that it will remain ductile for over 50 years of exposure to hot chlorinate water for 100% of the time. However, there has been controversy over the validity of the chlorine resistance test (ASTM F2023). Therefore, we recommend only using PEX pipe with the highest chlorine resistance rating (5) no matter what your pipe is used for, even cold water.